The neat trick with Stoppard's play is how he places the most subsidiary characters in Shakespeare's play "Hamlet" in the foreground and relegating the famous narrative--the Prince of Denmark taking his cue from a ghost and investigating the death of his father and, in time, plotting to expose the killer and take revenge in ways too clever to be wholly successfully in the world as it's constituted-- into mere background noise. There has been sufficient commentary over the decades, perhaps the centuries , as to what the actual relationship of Rosencrantz and Guilderstern was to the the troubled Prince Hamlet, a question worth pondering and certainly one that provides endless gristle for the industry that produces Shakespeare criticism. Tellingly, Shakespeare was mum on the subject , since in his day there was little in the way of poets and playwrights furnishing their own comments and critical apparatus to consider the work. I suspect he hadn't given it much thought and considered them strawmen who's purpose , who's function was to basically emerge, say their lines and then recede, their dialogue, such as it was, functioning to move the action along. To a certain degree, the theorizing over Rosencrantz and Guilderstern has been a learned indulgence, a species of balderdash. Fun, but the speculation is poetry of a sort, a wandering in intangibles, intriguing but finally inconclusive. Tom Stoppard , though, decides not to theorize but to use his imagination instead, investigating the quality of existence R and G have when they are not in the presence and command of Hamlet, Polonious or Gertrude. With the famed play reduced to background bustle that emerges to the forefront only occasionally, R & G are basically amnesiacs barely aware of who they are and where they are and what they are doing. Clever with words, free associating as a means of constructing their own narrative line, this pair are conspicuously modeled after the tramps Vladimir and Estragon in Samuel Beckett's "Waiting for Godot". In the Beckett, the two hobos find themselves on a road they cannot name in a life they cannot remember, trying to recollect their names, where they were, where they are going , prating on as they await the arrival of someone named Godot , who would make everything clear and provide a direction for the indigents. Godot , though, does not come, and Vladimir and Estragon remain as the play closes, defined, if that's the word, by their rudimentary role, to wait for someone or something to clear up the confusion, to reveal something large. Smart folks have long guessed that Godot represents God or Jesus or something other religious construction; Beckett, though, refrained from debating the existence or non-existence of a deity and instead gave us a grim metaphor of modern existence, civilizations reduced to rote practice, routines, conventional thinking, a horror of unacceptable repetition that we are forced to reenact however much our backs , feet and souls ache, with the promise of deliverance deferred and filed away with a legacy of other cliches and tropes that no longer sparkle. It's an existential hell; all we know of the world's condition is the perpetual waiting. Stoppard takes it a little further, with the two aimless, talkative, amnesiac Rosencrantz and Guilderstern given momentary purpose in world that suddenly has a place for them when the original "Hamlet"play intervenes in the pair's procrastinating dither. As Hamlet and others take the foreground, the dialogue switches to Shakespeare's original dialogue; queried and instructed by their superiors, R and G respond as the Bard originally had them, and then are left alone , again, to their own devices, slumping shoulders again, back to pondering and wondering without end who they are and how they got there and what it is they are supposed to be doing. A life guided by the enlivening elements of philosophical certainty or religious fervor exists for others, a privileged crown in the background operating in narratives of their own invention , scheming . plotting and lusting to reasoning that is entirely self-serving. What one can do with this is fascinating, endlessly so, and one needn't think too hard before coming up with an analog for which Stoppard's absurdist plot is a keen metaphor: think of millions of Americans obsessed with the fictionalized , extra-curricular skulduggery witnessed on professional wrestling programs. Witness the arguments of a very few mostly white politicians about principles that are essentially bankrupt virtues but which still excite an agitated electorate that knows only frustration and and the return of conveniently hazy "good old days". The theme is waiting for someone or something to arrive that will clean up the obscuring mess we've made of our associated cosmologies. The uniform experience is the waiting,the waiting, the waiting. 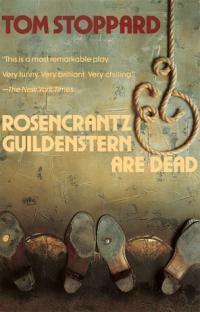 "Rosencrantz and Guilderstern are Dead" leaves you with this feeling, that bit of uncertainty that makes you question even the ham sandwich you might be raising to your mouth. It provokes, it agitates, it haunts you in large and small ways. What are we doing , who are we, how did we come to not remember where we came from? Stoppard asks the question and convincing responses are not fast in coming.